frustration, anger and anxiety to calm, confident self-leadership." ​those don't work. You can't stand the anxiety and overwhelm anymore. In a nutshell, to experience more success, freedom and fulfillment. 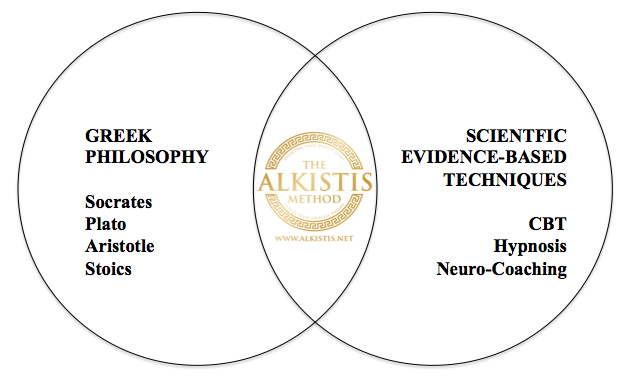 What is unique about The ALKISTIS Method®? It integrates ageless wisdom of ancient Greek philosophy (Socrates, Aristotle, Plato & Stoicism) with modern scientific, evidence-based techniques. Get Your Free Report-Summary of the book. The ALKISTIS Method® A unique method for building authentic, effective leaders who people respect & love® is applicable to all professionals—from CEOs to educators to entrepreneurs - It can empower you to bring out your highest potential. There is no such thing as a magic formula. But many times, when you find yourself confused, in, over your head with variables, uncertainties and doubt, it is vital to have such tools to fall back on, to help you to pull back, and through structured thought, make sense of it all - and take action.